There was some chatter online yesterday about the fact that the UK Supreme Court sat for the first time with a 3-2 female-male majority. The Supreme Court of New Zealand had done so last year. Despite the complement of female justices over the last 20 years, the Supreme Court of Canada doesn’t seem to have had a female majority panel yet. And there haven’t been sufficient female justices on the High Court of Australia for it to have happened there. Against that backdrop, I thought I’d find out if and when the Irish Supreme Court had first sat with female majority panels, and this is what I found. 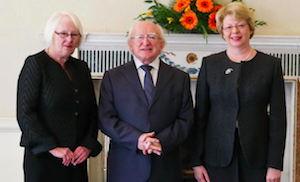 The first majority female panel in the Irish Supreme Court happened more than EIGHTEEN years ago. Denham J was the first woman appointed to the Supreme Court, in 1992; McGuinness J was the second, in January 2000; and a female 2-1 majority on a 3-judge panel of the Supreme Court happened almost immediately after that appointment, in February 2000. In Dalton v Governor of the Training Unit  IESC 49 (29 February 2000) Denham and McGuinness JJ sat with Hardiman J (the image, above left, is of McGuinness J (left) and Denham J (right)). 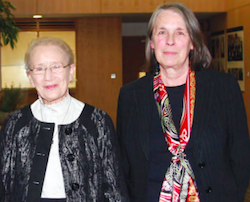 Macken J (pictured right) was the third woman appointed to the Supreme Court, in May 2005; and a female 3-2 majority on a 5-judge panel of the Supreme happened soon after that appointment, in November 2005. In DPP v Gilligan  IESC 78 (23 November 2005) Denham, McGuinness and Macken JJ sat with Geoghegan and Fennelly JJ. There does not seem to have been a 3-judge panel on which all three of Denham, McGuinness and Macken JJ sat before McGuinness J retired at the end of 2005. Denham J became Chief Justice in 2011 (and retired in 2017). 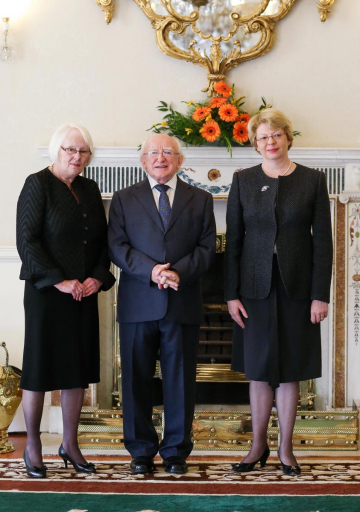 The next women appointed were Laffoy J (2013–2017) and Dunne J (2013-present), appointed on the same day (pictured left are Laffoy J (left) and Dunne J (right) on the occasion of their appointment to the Supreme Court by President Higgins (centre)). The first all-female 3-judge panel is Cagney v Bank of Ireland  IESC 80 (22 October 2015) on which Denham CJ, Laffoy and Dunne JJ sat. The next women appointed were O’Malley J (2015-present; pictured right), and Finlay Geoghegan J (2017-present). The first female 4-3 majority on a 7-judge panel was Murray v Budds  IESC 4 (02 February 2017) where Denham CJ, Laffoy, Dunne and O’Malley JJ sat with O’Donnell, McKechnie and MacMenamin JJ. Incidentally, given that some of the recent coverage of the UK Supreme Court centred on the fact that Lady Arden succeeded her husband Lord Mance on the Supreme Court bench, it should be noted that Ireland got here first too, with Finlay Geoghegan J (pictured left) being appointed to the Supreme Court some time after her husband, Hugh Geoghegan, retired from that court. People ask me sometimes, ‘When do you think it will be enough? When will there be enough women on the court?’ And my answer is: when there are nine. By that standard, the Irish Supreme Court has a way to go for an all-female bench of 5 or 7, or for every judge to be female. 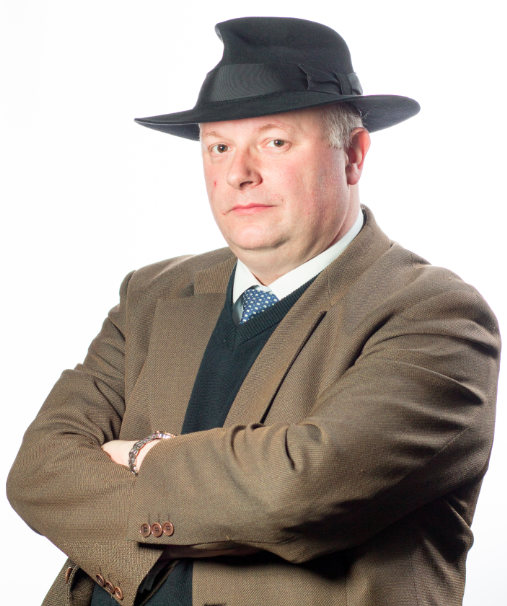 But it is far ahead of many of its counterparts elsewhere in the common law world. And it has done so quietly, without any of the fanfare that accompanied yesterday’s hearing in the UK Supreme Court.